Water is essential for life. It’s essential to stay hydrated to keep your body healthy and strong. The average amount of water in an adult’s body is about 10 gallons. We need to drink at least 48 ounces of water per day to replace the water that is lost through urination, sweat, and breathing. If we don’t, we’re likely to become dehydrated. Many nutrients dissolve in water so they can be absorbed more easily in your digestive tract. Many metabolic processes need to take place in water. Water is a component of blood and thus is important for transporting chemicals and nutrients to cells and tissues. Each of your cells is constantly bathed in a watery fluid. Water carries waste materials from your cells to your kidneys so they can be filtered out and eliminated. Water absorbs and transports heat. For example, heat produced by muscle cells during exercise is carried by water in the blood to the surface, helping your body maintain the right temperature balance. The skin cells also release water as perspiration, which helps keep you cool. We should drink at least 6-8 glasses of water (48 to 64 ounces) each day, although 8-12 glasses is optimal. That basically means having a glass of water every two hours while you’re awake. Don’t wait until you’re thirsty; schedule regular water breaks throughout the day instead in order to stay hydrated. 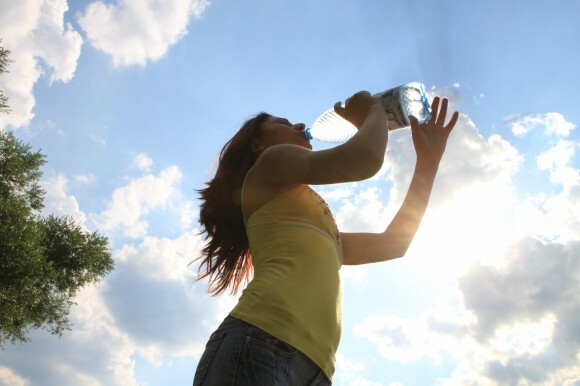 Several factors are thought to increase the likelihood of chronic mild dehydration: a faulty thirst “alarm” in the brain; dissatisfaction with the taste of water; regular exercise that increases the amount of water lost through sweat; living in a hot, dry climate; and consumption of diuretics such as caffeine and alcohol. Diuretics are substances that draw water out of your cells and increase the rate of urination. Surprisingly, if you drink 2 cups of water and 2 cups of coffee, cola, or beer, you may end up with a net water intake of zero! Be aware of your “water budget.” If you drink coffee or other dehydrating beverages, compensate by drinking an additional glass of water. There is currently a great concern about our water supply. It is becoming increasingly difficult to find pure water. Most of our water supply is full of chemicals, including not only chorine and fluoride, which are routinely added, but a wide range of toxic and organic compounds and chemicals, such as PCBs, pesticide residues, nitrates, and heavy metals such as lead, mercury, and cadmium. It is estimated that lead alone may contaminate the water of more than 40 million Americans. To determine the safety of your tap or well water, contact your local water company. Most cities have a quality assurance program that performs routine analyses. There are also private water-testing companies that will test your water for a fee. Once you have your water analyzed and determine the predominant toxin, if any, you can make an informed decision about the water purification unit that’s right for you. What it the best home filtration unit? It depends on the predominant toxin. For example, if the primary toxin is lead, a carbon filter would provide very little benefit. This is significant, since carbon filters are the most popular water purification units sold. Types of water purification units include granulated activated carbon, solid carbon block, reverse osmosis, and distillation. The safety of our water supplies are being scrutinized, and for good reason. Check your water supply to make sure it is safe. If it isn’t, invest in a home water purification unit that will remove the impurities. It’s essential to stay hydrated. You need water for good health. Make sure you drink enough of it, and that the water you’re drinking is pure.